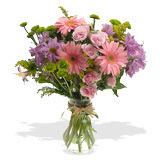 Baby Boy Flowers Help the new parents celebrate and send new baby flowers from FlowerFresh. If you like to stick with tradition, send a baby blue flower for the birth of their son. Let FlowerFresh do the work for you and create a magnificent baby flower arrangement for you and then send it to the new parents. We pride ourselves on our excellent service and you can be guaranteed that your baby boy flower will be delivered in perfect condition to the new parents.